I couldn’t help but smile when I saw this Awl story about what the members of the Babysitters Club are up to these days. 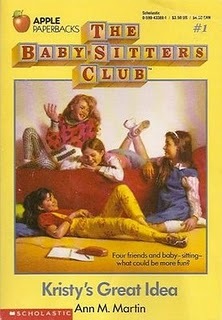 Growing up, I was a huge Babysitters Club fan and even started my own club. I hung up handmade flyers around town to make the locals aware of my babysitting skills (or lack thereof), and surprisingly landed some gigs. I still keep in touch with one of the moms who responded to my flyer and consider her to be a dear family friend. 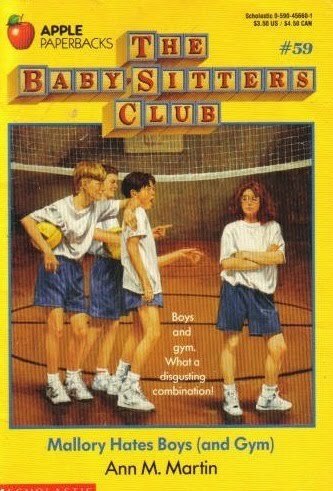 As weird as it sounds, the Babysitters Club characters were like my imaginary sisters who came to life whenever I started reading. I found comfort in reading about young girls my age, and could relate to much of what they went through. As an only child, I looked to books for entertainment and was “that girl” who read a book while walking two miles to and from school every day. I was the girl who befriended the school librarian and who used to “steal” my parents’ flashlight so I could use it to read under the covers at night. I’d hold my finger next to the flashlight’s on/off switch so I could quickly turn it off if I thought Mom and Dad were going to come into my room and tell me to stop rebelliously reading. 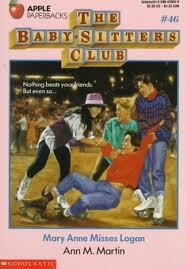 I would feign sleep for even longer when reading Babysitters Club books about Mallory. I had never met another Mallory in real life before, so I gravitated toward my fictional counterpart, even though she spelled her name with an “o” and looked nothing like me. For whatever reason, Mallory’s name was often accompanied by a drawing of a smiley face, so I used to draw the same type of smiley face under my name whenever writing out my name at school. Kristy started up a softball league with her partner Tori and works in the Baltimore public school system. She met Tori while doing Teach for America and seems to be doing pretty well for herself. Claudia is a graphic designer who makes intricate wire jewelery. She has a live-in boyfriend named Arthur, and she wears crazy glasses, plays the upright bass and now eats sprouts instead of sweets. Boy-crazy Stacy pursued a career in acting and modeling but couldn’t book any jobs. She had an affair with the owner of a Los Angeles club, of which she is now co-owner. She has some problems she needs to work through but is at least trying to carve out new opportunities for herself. This spring, she’s launching her own line of handbags. Maryanne apparently doesn’t know how to use the Internet. And she didn’t marry Logan! Tear. I knew they broke up, but I always hoped they would rekindle their love for each other. I remember reading about their middle school romance and thinking Logan was a cutie, at least based on the cover illustrations of him. Dawn has “kind of gone off the deep end.” She owns and operates a self-sustaining llama farm, wears lots of bucket hats and makes her own yarn. The only Babysitters Club member she talks to regularly is Mary Anne. Mallory graduated from Riverbend boarding school with honors, then went to Regis College, where she majored in women’s studies and English. (Go Mallory!) She ended up getting pregnant, though, and had to drop out of school. Known for her red frizzy hair and oversized glasses, Mallory has some mad skills when it comes to playing Mario Kart for Wii. Jessi seems to be living a relatively normal life. The talented ballerina, who always wanted to be a professional dancer, joined a dance company but was forced out of it due to a knee injury. Now she’s in physical therapy school. Shannon, the overachiever of the group, is now a competitive dog breeder. (Talk about randomness!) She especially likes the Cavalier King Charles Spaniel and has so far raised just one champion dog, Puttencove Promise. Logan didn’t do so well later in life. He got caught up in a gang called The Badd Boyz, was arrested for stealing car radios, dropped out of Student Council and even ditched the Babysitters’ Club. Not cool, Logan, not cool. This is so great! Ha! Thanks for the updates. I used to love reading these books, too… and also rebelliously read at night when I wasn’t supposed to. However, after my flashlight trick failed too many times, I convinced my parents I was afraid of the dark and then used to sneak over to the night-light to read instead. I thought I was an 8-year-old genius.